"The Light Rail fantasy is about unsustainable development on The Spit and throughout Main Beach." "It is about circumventing the City Plan by Light Rail - 800m either side automatically increased to medium density, then using loopholes in the City Plan raising height limits and the density." "Nothing the mayor won't do to improve the lot of the development lobby." "This is about developing The Spit to the detrement of the residents, visitors and future generations." "It's about trying to wedge the State Government into approving the ASF project and the mayor's CST." Support local businesses in Main Beach - drop in after enjoying Our Spit. PLEASE HELP US FIND FELICITY'S MEMORIES! The failed council candidate clearly needs all of our help and we're thinking of printing shirts and even setting up a crowdfunding page (all money goes to the Fadden Forum of course) to help her in locating dozens of lost pieces of basic information, but we desperately need your help - can you help Felicity? After careful analysis of yesterday's Crime and Corruption Commission witness testimonies, we are left with little doubt there has to be some kind of memory-debilitating element or phenomena affecting the environment in the Fadden offices of federal LNP MP Stuart Robert. After careful analysis of yesterday's Crime and Corruption Commission witness testimonies, we are left with little doubt there has to be some kind of memory-debilitating element or phenomena affecting the environment in the Fadden offices of federal LNP MP Stuart Robert. It seems to have affected several office staff. This cluster-incident appears to have struck down these poor LNP, we mean 'independent' candidates and elected representatives right at the critical time they were to appear before the CCC. We would love any suggestions on how we can get this campaign, to find Felicity's precious memories, off the ground, and help these poor people, because Lord knows they need all the help they can get by the looks of it! Can you count along with us? 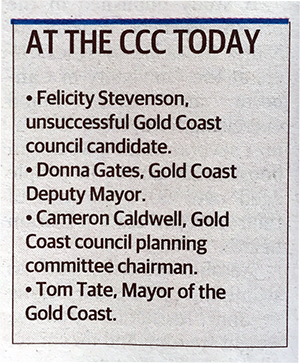 This edit shows the various points of memory loss, confusion, inability to 'recall' and 'I don't know' moments throughout Felicity Stevenson's appearance as a witness yesterday before the CCC's investigation and inquiry into the last Gold Coast council elections. So there goes $875,000 of ratepayers money down the gurgler on an EPBC submission and a cruise ship docking feasibility study that has never and probably will never be released publicly despite being funded by ratepayers. No doubt Tate will ask Councillors to approve tens of thousands more $$$$ to pay AECOM and PWC to re-submit to the Federal Government their dogs breakfast, dishonest and incompetent EPBC submission with more cooked up (a)balone. Did we mention AECOM and PWC are also major partners in the ASF China Consortium vying for highrises & foreign casino on the Spit across the road from Tate's fantasy cruise terminal? 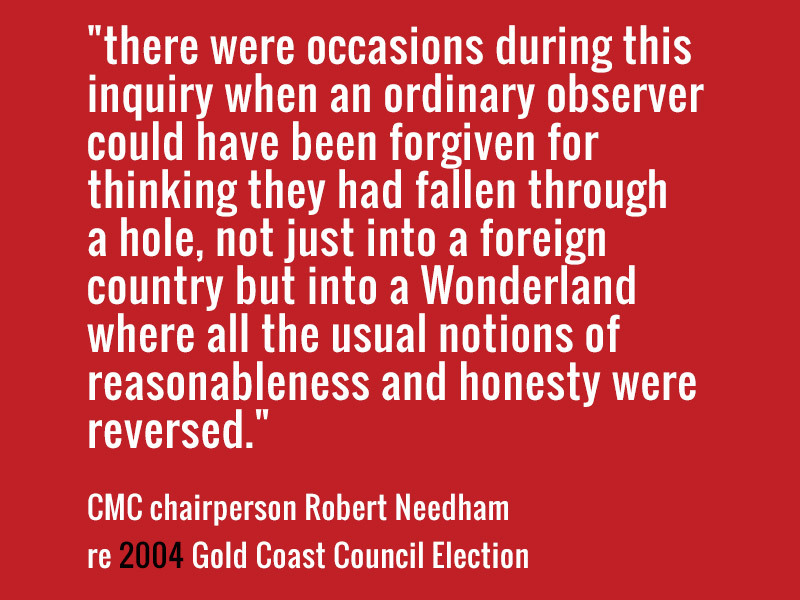 It's time for the Qld Auditor General to step in and examine the GCCC books.